Rated: R for brutal violence, language throughout, some sexual references and brief drug use. Organized crime has long fascinated both Hollywood and of the American public in general. It’s no surprise that one of the many books about it is now a movie: “Black Mass.” What may be a surprise to folks who’ve seen the posters and print ads is that the ensemble cast is led by Johnny Depp in impressive prosthetic makeup. He delivers an excellent performance, reminding us that he can do more than just act drunk and chew scenery. The movie is a solid true-crime tale, likely to please serious enthusiasts as well as those who like serious dramas about people’s bad actions leading to their inevitable fall. Depp plays Jimmy “Whitey” Bulger, once an inmate at Alcatraz, now the head of South Boston’s Irish-American Winter Hill Gang. His story is told in extended flashbacks as his former associates give testimony to the FBI. The title comes from the (as the book calls it) “unholy alliance” between Irish mob boss Bulger and FBI agent John Connolly (Joel Edgerton). Connolly is part of a task force trying to take out the Italian mob presence in Boston, and grew up with Bulger. This gives him enough credibility to persuade the man to become an FBI informant – but informing on the rival Italians, not on his own underlings’ activities, which Connolly helps cover up by insisting he’s protecting an asset. Unsurprisingly, the violent and ambitious Bulger takes advantage of this protection, extending his reach and increasing his activity. As Connolly spends more and more time with Bulger, he starts to change, becoming more involved and more accepting of criminal activity. He’s able to convince his bosses that everything is going well, however, so it’s a long time before the whole thing falls apart. The cast is packed with character actors, and everybody delivers top-notch performances, even if they’re only given a few scenes. Depp in particular brings 110% to the table, giving us a man who almost always appears calm and collected, but is fueled by a calculating and vindictive rage. Edgerton has to walk a fine line of character development, taking Connolly from an apparently law-abiding FBI agent to a man who parties in clubs with criminals and overlooks murders. He walks that line very well – like many of the actors who seem to shift during the film, it seems as though he’s giving us further and further insight into the corruption that already exists within the character. 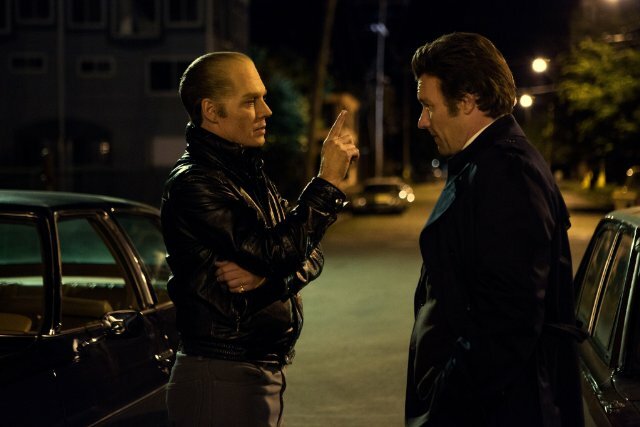 Fans of action-movie style gangster tales will probably be disappointed – “Black Mass” is a film whose executions are mostly quiet, matter-of-fact affairs, and there are no thrilling chase scenes or shootouts. Folks who love a well-crafted drama and are more interested in reality-based stories than in romanticized violence are the target audience, and will notwalk away disappointed.